Artists: Nida Abidi, Ruby Chishti, Meena Hasan, Mala Iqbal, Mona Saeed Kamal, Gelare Khoshgozaran, Sa’dia Rehman, Negin Moss, Katherine Toukhy. by an independent curator and artist Jaishri Abichandani. One of the most enduring and influential books in global popular culture is A Thousand and One Nights. Understood as an amalgamation of fables originating from West and South Asia, its main protagonist is the fictional Queen Sheherzade, whose stories are told to countless young girls from North Africa to South East Asia. The telling of the stories varies in each account but the Vazir’s daughter retains the qualities of being erudite, amusing and ultimately more powerful and wise than the monarch himself. Beguiling him with the foibles of humankind long enough to generate understanding and love within the king, her mental faculties allowed Sheherzade not just to survive a night but reign as a queen while sparing the lives of other women in the monarchy. It is with this impetus that Sheherzade’s Gift examines the work of women artists from Egypt, Iran, Pakistan, India and Bangladesh who reside in the US. Their lived experiences vary from being recent immigrants to being second generation Americans. Brought together by membership in the diaspora, the work of these artists speaks from individual points of reference. Through painting, sculpture, drawings, installation and video, these artists tell stories that seamlessly traverse continents, languages and aesthetics with humor and pathos. A curious mirroring takes place in the exhibition, whether through the repeating imagery of birds, text or bodies. Specific approaches by artists become visible through the examination of similar subjects. The awkwardness of inherited and acquired languages unravel in the text based works of Sa’dia Rehman and Mona S. Kamal. While Rehman repeats the phrase “Neither Here Nor There” as a state of mind or mantra of indifference and ambivalence across the gallery walls, Mona burns her name in Urdu, (an familiar script even if it is the mother tongue) over and again on reclaimed planks of wood. Negin Sharifzadeh and Ruby Chishti employ restrained palates in their sculptures. While their work is representational, a minimal approach applied to materials and content belies its decorative qualities. An equal pathos resides in the craftsmanship of their work, based largely in themes of life and death – Chishti presents sculptures of birds, specifically crows while Sharifzadeh builds nests. Crows reappear in two dimensional form by Mala Iqbal – presented in their original form and bound in a book of 140 ink drawings. Veiled women appear in various scales, from a large hand carved masonite sculpture by Kamal, to small graphite drawings by Nida Abidi and large watercolors by Katherine Toukhy. The bodies in their work occupy and become landscapes fraught with conflict, yet manage to retain poetry and beauty. The playfulness of Abidi and fragmentation Toukhy’s women are echoed in Meena Hasan’s paintings based on screen grabs of the Satyajit Ray film Charulata. Painted on textured plastic with a surface akin to pixels, Hasan’s brush strokes have a frenetic energy and display furious patterning across the surface. Gelare Khoshgozaran employs a similar device of screen grabs in her video 1989/2010 as Hasan does for her series. However Khoshgozaran and Rehman are the ones that appear as doppelgangers in this exhibition – the former born and raised in Iran while the later grew up in Corona, Queens. They place their racially ambiguous and queer bodies in public spaces examining the relationships between art, authorship and spectatorship – these engagements are presented as autobiographical videos that speak to global experiences of travel and migration, inclusion and exclusion. Featuring Tanwi Nandini Islam, Tahira Naqvi and Mala Iqbal with other artists from the exhibition. 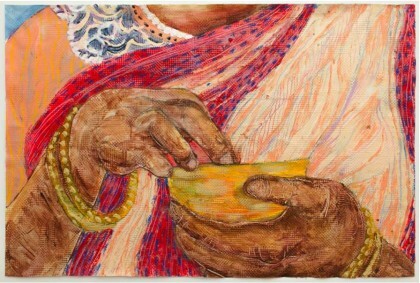 Jaishri Abichandani (born India) is an artist and independent curator. She received her MFA from Goldsmiths College, University of London and has continued to intertwine art and activism in her career, founding the South Asian Women’s Creative Collective from 1997 to 2013. She has exhibited her work internationally at various venues including P.S.1/MOMA, the IVAM in Valencia, Spain and the House of World Cultures in Berlin, Germany. Solo exhibitions include the Queens Museum, Rossi and Rossi in London, and Gallery Chemould in Mumbai. Abichandani served as the Founding Director of Public Events and Projects from 2003 to 2006 at the Queens Museum of Art where she co- curated Fatal Love: South Asian American Art Now, Queens International 2006 Everything All at Once and Her Stories: Fifteen Years of SAWCC. Her work is included in various international collections including the Burger Collection, the Asia Art Archive Collection and the Saatchi Collection. Abichandani is currently an Artist- in -Residence at Governor’s Island through LMCC’s Process Space program. Nida Abidi is a New York based artist who received her MFA from the School of Visual Arts in 2011. She has exhibited NurtureART, Cuchifritos Project Space, C24 Gallery, the Taubmann Museum of Art, Queens Museum and Rossi & Rossi in London. Abidi works primarily through the mediums of video, drawings, and paper mache objects. Ruby Chishti (born 1963 in Jhang, Pakistan) is an artist based in Brooklyn, NY. Primarily a representational sculptor, her work is largely autobiographical in nature. Ruby was formally educated at the National College of Art in Lahore, Pakistan. The fourth daughter in a large family, her family life was marked by pain and recurring losses of loved ones. As a young woman, the experience of caring for her invalid mother for over a decade deeply impacted Ruby’s psyche and practice – this internal experience found it’s echoes outside in the repressive political climate of Pakistan during the regime of Zia ul Haq, a time of great censorship and complete state sanctioned ban on creative expression. Ruby moved to the US in 2001 with her husband, the artist Khalil Chishti. A number of her important large works were created during her stay in California, including “Cessation “, “ ….then I buried my pride along with you,” and Alchemy, all from 2008. Ruby and Khalil Chishti moved to New York in 2009, which the artist marks as a pivotal moment stating that she was ﬁnally able to stop living in her past and begin to be able to look at it with some objectivity. Ruby has exhibited her work in the US, UK, Hong Kong, Canada, Australia, India and Pakistan including at the Henry Street Settlement/ Abrons Art Center, Aicon Gallery, the Queens Museum of Art, and the Taubman Museum of Art amongst other locations. She has held residencies at Vasl in Pakistan, the Harris Museum in the UK, the Vermont Studio Center and at Transparent Studio in DUMBO, NYC in 2012. Mala Iqbal lives and works in Queens, New York. She received an MFA from the Rhode Island School of Design in 1998. Honors include: residencies at Yaddo, Saratoga Springs, NY; The Hermitage, Englewood, FL; and the Fine Arts Work Center, Provincetown, MA. In 2008 she received a New York Foundation for the Arts (NYFA) fellowship in Painting. Exhibitions include: solo shows at PPOW Gallery and Bellwether Gallery in New York, Richard Heller Gallery in Los Angeles; and group shows throughout the United States as well as in Europe and India. Mona Kamal is a visual artist, whose origins are rooted in the Indian subcontinent,raised in Canada and currently residing in New York, she engages with photography, video, and installation to create contemporary multi-media narratives about migration, journeys, and identities. Mona creates spaces that create a dialogue about leaving and recreating the notion of home. She has exhibited throughout Canada, in New York and in New Delhi India. Mona has had solo exhibitions at YYZ Artists’ Outlet and the Harbourfront Centre in Toronto, Ontario as well as group exhibitions at A Space Gallery in Toronto, The Museum of Contemporary art Calgary and the Art Gallery of Calgary in Calgary, Alberta, Gallery Espace (New Delhi), Rush Arts Gallery, Exit Art and the Queens Museum of Art in New York. She has received several grants for the creation of her artworks through the Ontario and the Toronto Arts Councils. Ms. Kamal has also attended several international residencies including:), the Banff Centre in Banff, Canada (2011), Studio LLC program at the Jamaica Center for Arts and Learning (2011) and the Sanskriti Foundation in New Delhi (2007). She received her BFA from NSCAD University in Halifax Canada and her MFA from Parsons the New School for Design. She also teaches at BMCC/CUNY and Parsons the New School for Design. Gelare Khoshgozaran is an artist, a translator and an independent scholar living in Los Angeles, CA. She has contributed to multiple Persian and English publications and websites including Parkett, WildGender and ZanNegaar Journal of Women Studies. She is the translator of Critical Theory: A Very Short Introduction to Persian. In 2013 her research and film project, rial and tERROR was featured in Contemporaneity Journal Vol.3 and her work was exhibited in Encyclonospace Iranica at Access Gallery, Vancouver and A Bomb, with Ribbon Around It at Queens Museum, New York. Gelare received her undergraduate degree in Photography from the University of Arts, Tehran and her MFA from the University of Southern California. She was the winner of the 2011 Neely Macomber Travel Award and ArtGenève’s Meta Young Art Critic Award 2012. Sa’dia Rehman’s (b.Queens, NY) works with themes such as isolation, shame and hidden social boundaries. Her installations, sculptures, and works on paper explore subjects that are considered taboo such as sexuality, power hierarchies and normative ideals around gender which are depicted through formal strategies like repetition of motifs and patters and accumulations of words. Rehman grew up in such a community where these taboos were hidden yet aggressively maintained. I alter silhouettes and outlines of myself taken from childhood photographs to reveal childhood visions that exist within uncomfortable and isolated settings. I see materials, methods, traditions, and history as elements that can be sampled from and combined to create new forms and new meanings. I seek out and research the oddities of a place and time. Rehman has shared her work internationally and nationally at venues such as the Taubman Museum (2013), Queens Museum of Art (2012), Jersey City Museum (2010), Grey Noise Gallery (2008) Exit Art (2007). Rehman was selected to participate in LMCC’s Artists Summer Institute (2011) and residencies at the Bronx Museum of Art (2008) and National Gallery of Art, Islamabad, Pakistan (2006). Her work has been featured in publications such as ColorLines Magazine, The NY Times, Harper’s Magazine and Art Papers. Rehman is the director of +91 Foundation, the first nonprofit to provide a platform for highlighting contemporary art practice from South Asia and its diasporic communities to the public domain. Negin Sharifzadeh, born in Tehran, Iran, is a multi-disciplinary artist, performer and filmmaker based in New York. Negin’s short animated film, Even Gray Feels Blue, has been featured in festivals around the world, and was awarded Best Experimental Film at the 2012 Williamsburg International Film Festival,Best Animated Film at the 2012 Crown Heights Film Festival and Best Video Art Production at the Alwan Center forthe Arts in New York. Negin has had solo exhibitions and performances in Tehran, Los Angeles, Chicago, New York and has been part of numerous international group exhibitions. She received her BFA in Sculpture from faculty of Fine Arts, Tehran University in Iran in 2002, and her BFA from School of the Art Institute of Chicago in performing arts in 2010. Katherine Toukhy is an artist and arts educator living in Brooklyn, working both in the studio and in community. Her work has been shown in the Charles Wright Museum of African American History, FiveMyles Gallery, the Gateway Project, and many projects in Boston, where she attended Massachusetts College of Art, NJ, and Buenos Aires. Most recent awards include the completion of the Create Change Fellowship with the Laundromat Project; an award for “Best in Show” by curator of the Drawing Center, Claire Gilman, at WAH Center’s “Paperworks Unbound Show;” and inclusion in curator, Mahnaz Fancy’s top 30 selections out of hundreds of artworks for Curate NYC in 2013. She is also the creator of RASMI, a free summer arts program for youth of Arab or Muslim heritage in Brooklyn, funded by the Puffin Foundation and Brooklyn Arts Council.